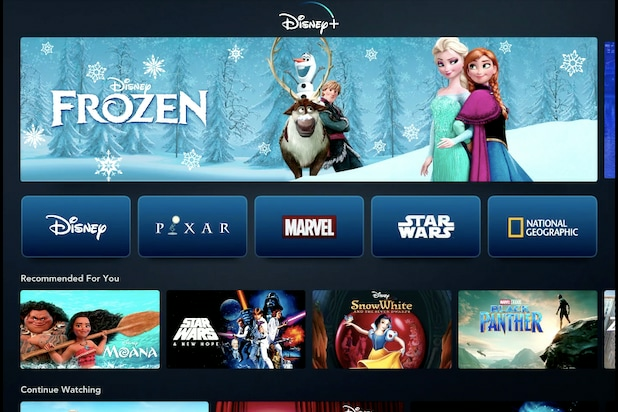 By the end of year one, Disney says its forthcoming direct-to-consumer streaming platform, Disney+, will house more than 7,500 episodes of television and 500 movies. But not all of those will be available for users to start binge-watching when the service launches on Nov. 12. 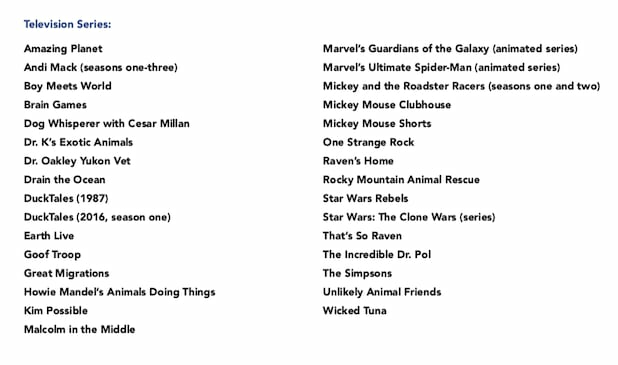 When Disney+ debuts, these originals will all be there for your viewing pleasure: live-action shows “High School Musical: The Musical: The Series” and Jon Favreau’s “Star Wars” spinoff series, “The Mandalorian”; animated series “Forky Asks a Question” (starring the Forky character from “Toy Story 4”); Pixar Animation Studios’ short film series, “SparkShorts”; the Kristen Bell-produced unscripted series, “Encore!”; docuseries “Marvel’s Hero Project,” “The World According to Jeff Goldblum,” and an untitled project about Walt Disney Imagineering; and the live-action “Lady and The Tramp” film. However, some eagerly anticipated original titles — like all of those Marvel Cinematic Universe spinoff series and the “Rogue One” prequel show — won’t be available until “Year One” and “Year Two,” as Disney put it during the company’s investor day at its Burbank, Calif. studios Thursday. But more than 25 of those series and 10 films will be available within the first year. 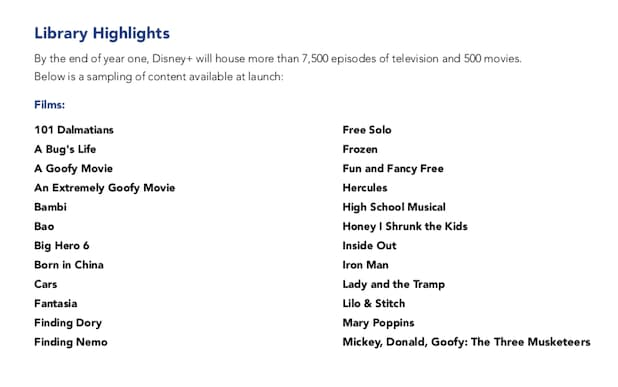 See below for Disney’s descriptions of what shows and movies will be on Disney+ at launch and what will hit the platform later. High School Musical: The Musical: The Series – The 10-episode scripted series, set at the real-life East High, where the original movie was filmed, follows a group of students as they count down to opening night of their school’s first-ever production of “High School Musical.” With meta references and some docu-style elements, it’s a modern take on the “classic” from 15 years ago. Show-mances blossom; friendships are tested, while new ones are made; rivalries flare; songs are sung; and lives are changed forever as these young people discover the transformative power that only high school theater can provide. The Mandalorian – The first ever live-action Star Wars series is written and executive-produced by Emmy-nominated producer and actor Jon Favreau, with Dave Filoni (“Star Wars: The Clone Wars”) directing the first episode. The highly anticipated series features an all-star cast including Pedro Pascal, Gina Carano, Carl Weathers, Giancarlo Esposito, Emily Swallow, Omid Abtahi, Werner Herzog and Nick Nolte. Set after the fall of the Empire and before the emergence of the First Order, the series follows a lone gunfighter in the outer reaches of the galaxy far from the authority of the New Republic. Diary of a Female President – Told from the narration of her diary, the series follows a Cuban-American 12-year-old girl as she navigates the ups and downs of middle school and her journey to becoming the future president of the United States. Gina Rodriguez (“Jane the Virgin”) and Emily Gipson (“I Can and I Will”) will executive produce along with Ilana Peña (“Crazy Ex-Girlfriend”). Untitled Cassian Andor Series – Diego Luna will reprise his role of rebel spy Cassian Andor in this series set during the formative years of the Rebellion prior to the events of “Rogue One: A Star Wars Story.” The rousing spy thriller will explore tales filled with espionage and daring missions to restore hope to a galaxy in the grip of a ruthless Empire. Alan Tudyk will also reprise his role as K-2SO with Stephen Schiff (“The Americans”) as showrunner and executive producer. Forky Asks a Question – Forky, from Disney and Pixar’s “Toy Story 4,” is a craft project created from trash, so he has important questions about how the world works, such as: What is love? What is time? And of course, the deepest question of all, What is cheese? He explores all of these questions and more in a series of 10 shorts. SparkShorts – Disney+ will be the exclusive home of “SparkShorts,” the Pixar Animation Studios short film series designed to discover new storytellers and explore new storytelling techniques from across the studio. Monsters at Work – Inspired by the characters of Pixar’s “Monsters, Inc.,” the animated series from Disney Television Animation picks up six months after the events of “Monsters, Inc.” and follows Tylor Tuskmon, an eager and talented young mechanic who works on the Monsters Inc. facilities team but dreams of working his way up to the Laugh Floor. Returning cast members Billy Crystal, John Goodman, John Ratzenberger, Bob Peterson and Jennifer Tilly will join new cast members Ben Feldman, Kelly Marie Tran, Henry Winkler, Lucas Neff, Alanna Ubach and Stephen Stanton. Star Wars: The Clone Wars – The Emmy-winning animated series will be returning with 12 all-new episodes exclusively on Disney+. This will mark the return of classic characters Anakin Skywalker, Obi-Wan Kenobi and Padmé Amidala, as well as fan-favorites Ahsoka Tano and Captain Rex. Encore! – Executive producer Kristen Bell brings together former castmates of a high school musical, tasking them with re-creating their original performance in a high school reunion like no other. Emotions run high as the former students face faded friendships, former flames, self-doubt, and killer choreography. Through it all, these unlikely groups of friends–with the help of Broadway’s best–just might pull off a standing-ovation-worthy performance of beloved musicals like “The Sound of Music,” “Beauty and the Beast,” “Annie” and more. Untitled Walt Disney Imagineering Documentary Series – The documentary series chronicles the 65+ year history of Walt Disney Imagineering with parallel storylines of the people, the craft, and the business. Created by Academy Award and Emmy-nominated director and producer Leslie Iwerks, series includes exclusive interviews and never-before-seen footage from Disney’s parks around the world. Cinema Relics: Iconic Art of the Movies (working title) – Cinema Relics is an anthology series that takes a unique look at beloved films through the props & costumes (now modern ‘artifacts’) that made them unique – from the craftspeople who created them, the actors who interacted with them, and the collectors / archives who own and cherish them. The show will be hosted by film historian/collector Dan Lanigan. 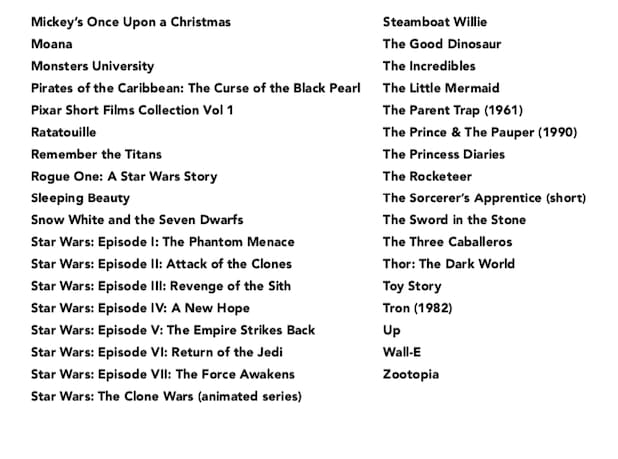 Among the films featured in the first eight episodes are “Pirates of the Caribbean: The Curse of the Black Pearl,” “Mary Poppins,” “The Muppet Movie,” “Tron” and “Who Framed Roger Rabbit?” CINEMA RELICS is produced by ABC Studios, Alternative and executive produced by Jason Henry and Dan Lanigan. Into the Unknown: Making Frozen 2 – As never before in its near-century long history, Walt Disney Animation Studios is opening its doors, allowing cameras to capture in intimate detail how the voice cast, directors, and team of artists come together to create “Frozen 2.” This multi-episode documentary series shows the hard work, imagination, heart, fun and intensity that go into making one of the most highly-anticipated Disney Animation features of all time. Magic of Animal Kingdom – In the heart of Central Florida, a team of more than 1,000 highly respected animal-care experts, veterinarians and biologists perform groundbreaking work at Disney’s Animal Kingdom theme park and Epcot’s SeaBase aquarium. Now for the first time, National Geographic will offer viewers an all-access pass into the 24/7 world of the incredible animal caretakers running one of the most advanced veterinary facilities in the world. (Re)Connect – In each episode of (Re)Connect, a family will disconnect from their busy lives, devices and outside influences in order to address a relatable issue that’s driving a wedge between them. With the help of a specialized expert, each family will go on a unique journey to confront the family’s dilemma head on. Can they finally come together as a family to overcome their obstacles…and reconnect? Rogue Trip – Renowned journalist Bob Woodruff travels the world with his 27-year old son, Mack, and visits all of the places your average tourist is least likely to venture – the roguish, often misunderstood and frequently overlooked corners of the world whose hidden corners surprise, amaze and inspire. This is the family vacation most of us are least likely to take. Shop Class (working title) – A new competition series featuring teams of inventive students, who are tasked with designing, building, and testing new contraptions. In each episode a panel of experts will rate their work based on engineering, design, and the final test of the build. In the final episode one team will be named Shop Class Champs. Earthkeepers (working title) – From the award-winning creators of “Chef’s Table” and the producers of “One Lucky Elephant,” “Earthkeepers” is a cinematic documentary series that enters the adventurous lives of the people changing the way we see the animal kingdom. The episodes focus on conservationists and the animals they’ve devoted their careers to studying, diving deep into the personal trials and professional breakthroughs of protecting the planet’s most endangered species. Executive Produced by Jason Sterman, Brian McGinn and David Gelb for Supper Club and Cristina Colissimo and Jordana Glick-Franzheim for Wellworth Pictures. Lady and The Tramp – A timeless re-telling of the 1955 animated classic about a prim and proper house dog and a tough but lovable stray who embark on a series of adventures and, despite their different upbringings, grow closer and come to understand the true meaning of “home.” Starring Tessa Thompson (voice of Lady) and Justin Theroux (voice of Tramp), Kiersey Clemons (Darling), Thomas Mann (Jim Dear), Janelle Monae (voice of Peg), Yvette Nicole Brown (Aunt Sarah) and Sam Elliott (voice of Trusty). Noelle – Nick Kringle (Bill Hader) is first in line to become Santa Claus, but he struggles at every step of the way. His younger sister Noelle (Anna Kendrick) enjoys all the perks of being a Kringle without any of the expectations or responsibility. As the holiday draws near, the pressures of being Santa become all too much for Nick, who disappears just weeks before the big day. Now it’s up to Noelle to scour the globe to find him, bring him home, and save the Christmas season. Cast also includes Kingsley Ben-Adir, Billy Eichner, Julie Hagerty and Shirley MacLaine. The Phineas and Ferb Movie (working title) – Stepbrothers Phineas and Ferb, their older sister Candace, Perry the Platypus and the Danville gang will reach a new pinnacle — Disney’s direct-to-consumer streaming service — when they are back together again in The Phineas and Ferb Movie, an animated adventure in production now. The movie, executive-produced by Dan Povenmire and Jeff “Swampy” Marsh (creators and executive producers of the long-running Emmy Award-winning series “Phineas and Ferb”), centers on Phineas and Ferb as they set out across the galaxy to rescue Candace who has been abducted by aliens and has found utopia in a far-off planet, free of pesky little brothers. Reprising their roles are: Ashley Tisdale as Candace Flynn; Vincent Martella as Phineas Flynn; Caroline Rhea as their mom, Linda; Dee Bradley Baker as Perry the Platypus; Alyson Stoner as Isabella; Maulik Pancholy as Baljeet; Bobby Gaylor as Buford; Olivia Olson as Vanessa; Tyler Mann as Carl; and Povenmire and Marsh as Dr. Heinz Doofenshmirtz and Major Monogram, respectively. David Errigo Jr. joins the cast as Ferb Flynn. Togo – Based on a true-life adventure in the Alaskan tundra, this story takes place in 1925, when an epidemic of diphtheria breaks out in a remote Alaskan town, causing countless children to fall gravely ill. The necessary antitoxin is hundreds of miles away, across treacherous terrain with a massive storm on the horizon. As the crisis grows more desperate, the village leaders realize their only hope lies with one man – Leonhard Seppala (Willem Dafoe) and his lead sled dog, Togo.